Stephen Perry, now 18 years old, was trying to avoid a water balloon fight in 2013 when he was swept up by police at his Wake County, N.C., high school; he revealed he had a small pocketknife and was charged with weapons possession. Rashe France was a 12-year-old seventh-grader when he was arrested in Southaven, Miss., charged with disturbing the peace on school property after a minor hallway altercation. This arrest wave, in many ways, starts at school. Concern by parents and school officials over drug use and a spate of shootings prompted a rapid buildup of police officers on campus and led to school administrators referring minor infractions to local authorities. That has turned traditional school discipline, memorialized in Hollywood coming-of-age movies such as “The Breakfast Club,” into something that looks more like the adult criminal-justice system. At school, talking back or disrupting class can be called disorderly conduct, and a fight can lead to assault and battery charges, said Judith Browne Dianis, executive director of the Advancement Project, a national civil-rights group examining discipline procedures around the country. Some of these encounters with police lead to criminal records—different laws for juveniles apply across states and municipalities, and some jurisdictions treat children as young as 16 as adults. In some states, for example, a fistfight can mean a suspension while in North Carolina a simple affray, as it is called, can mean adult court for a 16-year-old. Some jurisdictions are so overwhelmed that they are experimenting with routing schoolchildren into specially designed courts that would keep first-time offenders from being saddled with an arrest record. Others have passed new laws or policies to dial back police involvement in school discipline. The Justice Department and the Education Department issued guidelines this year on school discipline that warn school-based police officers to “not become involved in routine school disciplinary matters,” and the Justice Department has filed lawsuits challenging disciplinary procedures around the country. Police, judges and civil-rights organizations all say schools are increasingly the way young people enter the justice system. Data provided by a handful of local courts and the federal government tell a similar story. There are vast gaps in national arrest statistics, and comprehensive statistics on arrests in schools aren’t available. According to the U.S. Education Department’s Office of Civil Rights, 260,000 students were reported, or “referred” in the official language, to law enforcement by schools in 2012, the most-recent available data. The survey also said 92,000 students were subject to school-related arrests. There are no earlier comparable numbers—the Education Department requested the data because it couldn’t find good national research on the topic. Police departments first started assigning officers to schools in the 1950s as a way to improve student-police relations. More came in the 1980s to help with drug-education programs, followed by a big push in the 1990s as part of the tough-on-crime laws. In recent decades, a new philosophy in law enforcement had been applied to schools. It was “deal with the small stuff so they won’t go to the big stuff, and also it sent a strong message of deterrence,” said James Alan Fox, the Lipman Professor of criminology at Boston’s Northeastern University. School shootings, including in Bethel, Alaska, West Paducah, Ky., and Columbine, Colo., created a greater sense of urgency. “We had zero tolerance in the state of Texas because our gang problem was more prominent. You cuss out a teacher, you get a ticket, period,” said George Dranowsky, president of the Texas School District Police Chiefs’ Association. The goal was to show no misbehavior would be tolerated so actions wouldn’t escalate, he said. The No. 1 priority was “safety, taking care of our kids,” he said. Texas’ new limits on police officers in schools might lead students to think they can get away with more, he said. School districts, faced with high levels of violence in the 1990s, did the right thing to bring in officers, said Ian Moffett, chief of the Miami-Dade Schools Police Department. But “you had very limited choices for what the officers could do when they encountered a juvenile who had violated the law,” he said. Research by the University of South Carolina based on a multiyear U.S. Bureau of Labor Statistics survey, performed at the request of The Wall Street Journal, found those arrested as juveniles and not convicted were likely to earn less money by the time they were 25 than their counterparts. The study didn’t break out school arrests. Another consequence: Arrest records, even when charges are dropped, often trail youngsters into adulthood. Records, especially for teenagers tried as adults, have become more accessible on the Internet, but are often incomplete or inaccurate. Employers, banks, college admissions officers and landlords, among others, routinely check records online. Retired California juvenile court judge Leonard Edwards said the widespread assumption arrest records for juveniles are sealed is incorrect. The former judge, now a consultant with the Center for Families, Children and the Courts, an arm of the state court system, said his research indicates only 10% of juveniles nationally know they must request records be closed or removed. But that process is complicated and varies from state to state. Even terms like expungement and annulment carry different meanings depending on the state. The process usually requires a lawyer to maneuver the rules and to file requests through courts. “Our good-hearted belief that kids are going to get a fair shake even if they screwed up is an illusion,” Judge Edwards said. Amid a flurry of news coverage, the charges were dropped, but the arrest record remained. Ms. Wilmot’s mother, Marie, said the Florida Department of Law Enforcement declined to expunge the record. A second attempt, this time as an adult, was approved last week by a judge, who ordered her records sealed, Marie Wilmot said. The court action “can’t erase the trauma, pain or emotions, but this is a step towards truly moving on,” said Ms. Wilmot of her daughter, who is now a freshman at Florida Polytechnic University. Since 2013, schools who want to participate in the COPS program have to sign memorandums of understanding saying the officers won’t be used for disciplinary matters that should be handled by the school. 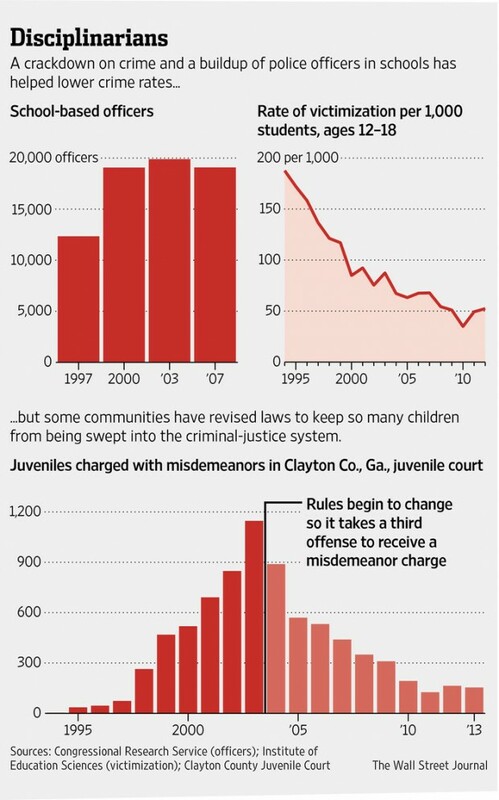 The juvenile court in Clayton County, Ga., has tried to address the problem. It received 46 misdemeanor school referrals in 1996, the year before police were placed on campuses, court records show. By 2003, referrals had grown to 1,147 for misdemeanors including school fights, disorderly conduct and disrupting school. Chief juvenile court judge Steven Teske said 80% of the referrals were for African-Americans, in a system where 71% of the students were black. The Justice Department has charged that the impact of school arrests falls disproportionately on African-American students. It has a consent decree with one Mississippi school district over their school discipline policies, including arrests. Clayton, a suburban county south of Atlanta, began changing its rules in 2003. Now, a first offense leads to a warning and a second to an education program. Only a third problem results in a misdemeanor charge and a court date. School misdemeanor referrals dropped 87% to 154 in 2013 from 2003, according to the court. Other districts are trying similar programs. In Florida, school districts including Miami-Dade and Palm Beach have used a new state law to shift from arrests to issuing civil citations for nonviolent, first-time misdemeanors with penalties including community service. Students who finish avoid arrest records. Arrests at schools were down 48% in 2012 from 2005, according to the Florida Department of Juvenile Justice. In Colorado, the Denver police and public schools agreed last year on how school-based police officers would be used, limiting their involvement in routine discipline. A state law passed in 2012 requires police departments to begin collecting statistics on involvement in school discipline. In Texas this year, after the new law that recommends most complaints first be handled by school administrators went into effect, misdemeanor tickets issued for school-related violations fell 37% to about 90,000, according to state court data. In Wake County, N.C., Mr. Perry was trying to avoid a water-balloon fight at school when he was taken into custody, according to a complaint filed with the Justice and Education Departments by Legal Aid of North Carolina charging that minority students are disproportionately disciplined. The Education Department is investigating discipline in the school system, a spokesman said. The teen, his mother and the complaint all agree that authorities didn’t identify any criminal activity until Mr. Perry volunteered he had a small pocketknife he had used to carve a tree. “I didn’t even know I had a knife. I just threw on my pants that day,” he said. The knife led to a weapons charge and a suspension. The charge was dropped, according to his mother, Lynn Perry. The suspension and time spent at court hearings left him short of the classes he needed to graduate, Ms. Perry said. Now she worries whether he can get into college. “It’s been a complete nightmare, and we can’t afford to get this stuff expunged,” she said. The Wake County Sheriff’s Department and the Raleigh Police Department declined to comment; the Wake County Schools didn’t respond to requests for comment. In Durham, the neighboring county, chief district court Judge Marcia Morey heads a pilot project that began this year to address these kinds of problems. Police officers are urged to refer first-time offenders to Judge Morey’s court, where they attend classes and mock sentencing to show the penalties they could have faced—including fines, fees and restitution costs of more than $1,000, along with probation. Teens who complete the program remain invisible to the world of criminal records. “I wanted you…to realize how important it is never to get any criminal arrests or citations,” Judge Morey told one group of teenagers. Judge Morey said she and fellow judges in regular adult court see about 500 teenagers a year charged with misdemeanor charges covering littering, fights at school and arguments with school instructors. Only 48 teens have been referred so far to her new court. 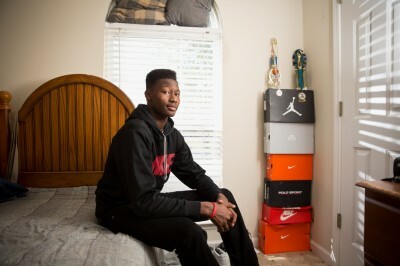 School had just started in Southaven, Miss., in 2012 when Rashe France and another student shoved each other in the hallway, the now-freshman said. Rashe, who is now 14, his family, and the Advancement Project civil rights group said no fists were thrown. School officials called the police. James Mathis, the boy’s grandfather, said Rashe was taken to the police station and charged with endangering the safety of other students. The case was thrown out before it got to Youth Court for lack of evidence, the family said. The DeSoto County Youth Court didn’t respond to requests for comment. Southaven police Chief Tom Long said he couldn’t discuss the specific incident. Speaking generally, he said state laws require school administrators report any act of physical violence to police, who are then obliged to respond. Katherine Nelson, communications director for DeSoto County schools, also declined to talk about particular cases. She said police would be called only if school officials thought a crime had been committed, a requirement of state law. Mr. Mathis worries what the arrest will do for his grandson’s future. Despite assurances from the school and police that the record is sealed, he doesn’t believe the record won’t one day surface.